Ridge tiles bear the brunt of the elements and are more susceptible to damage than all other tiles on your roof. Mortar weakens with age and exposure to the elements (the freeze-thaw cycle) and combined with high winds may cause ridge tiles to loosen. Small cracks gradually enlarge as rainwater enters the cracks, freezes and breaks the mortar apart. When this happens, the tiles will need new cement to fix them back in place. If some ridge tiles have become broken over time, you will need to replace with similar colour and profile tiles. For older houses this may be a challenge and replacing the entire ridge may be the way to go. Can I cement ridge tiles DIY or do I need a professional? 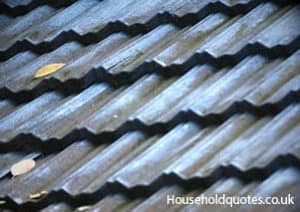 If you have noticed a problem with the tiles on your roof, particularly the ridge tiles, there are two approaches you can take. The first is to investigate the extent of the damage yourself and carry out any necessary repairs. Repairs required may include replacing a couple of damaged ridge tiles by bedding them with new cement. If you have the necessary safety equipment (scaffolding for safe access) and sufficient roofing skill, then you can carry out minor repairs yourself. Roofers have the experience and skill to identify roofing problems better than most homeowners. A few dislodged tiles may be a sign of compromised mortar along the entire ridge, refixing just a few tiles may only be a temporary measure. Specialist roofers will carry out their work to a higher standard and ensure the repairs will last. The work can be completed faster because roofers have the tools and equipment required to carry out the work. Small repairs re-bedding a couple of loose ridge tiles. Repointing cracked mortar on ridge tiles (not professionally recommended but some customers ask for this service). Ridge tiles re-bedding including removal, cleaning and replacement of broken tiles. The three jobs above will be used to provide a general price guide for carrying out the work. Contacting roofers on Quotatis will provide you with at least three quotes to consider which take into account your roof’s unique circumstances. On some roofs, all that is needed is to replace a couple of ridge tiles which have come loose in bad weather. For this type of job the tiles will involve lifting the affected tiles, cleaning off the old mortar underneath and around the tile edges. The roofer will use a three parts sand to one part cement mix (commonly referred to the 3-1 mix) to re-bed the ridge tiles. Roofers achieve a neat finish by pointing, and the job should take no more than 2 hours. This sort of job should cost between £150 and £300 depending on where you live in the UK, the size of the company who are carrying out the work (generally one-man businesses offer lower prices because they have fewer overheads), and the access equipment needed to access your roof. This price is for bungalows with easier access. Few professional roofers will recommend this type of ridge repair work for the simple reason that it is a temporary measure. Temporary may be a couple of months or a few years, but you can guarantee that the roof ridge will soon need attention again. Repointing involves scraping away the loose mortar and replacing with new. Some homeowners will request this type of job when the mortar is loose, but none of the tiles have been affected. For a typical semi-detached property, the cost for ridge pointing is between £125 and £250. Repointing is a simple job that will take a couple of hours. Most large roofing firms do not provide this type of service for the reason that it is not a long term solution. Ridge tiles re-bedding is a staple job for most roofers and should not take more than a day. The reference pricing basis is a 10 metres long roof ridge and involves the removal and inspection of the ridge tiles. The tiles are cleaned to remove the old cement, and the roofers will prepare and use a 3-1 mix to bed the tiles. The pricing assumes easy access to the roof with no requirement for scaffolding. An access platform will be used to ensure safe working access and the roofer will replace broken tiles as part of the job. Prices for this type of ridge tiles job falls within the £250 to £600 taking regional variations and company size into account. The type of roof your house has. The extent of the ridge damage which needs attention. Ease of access to the roof and the need for scaffolding. Whether you need new ridge tiles, or you are reusing the old tiles. VAT status of the contractor may add 20% to the final bill if they are VAT registered. Applications and approvals for diversions where your property overhangs a public footpath. Professionals recommend a periodic roof inspection so that you can detect roofing problems sooner. Some home insurance companies make this a condition for cover. You can speak to a roofer about this when they come to quote for you ridge tile job and remember to get your quotations from Quotatis. Ive got to price a big bungalow rebed ridge ,two long vallys,two barn end hips,one long hip i dont want to over charge them it roughly 100 meters worth . I need to re-bed approx 90-100 ridge tiles,how much sand & cement would I need to buy?